This moment of expensive lunacy is brought to you courtesy of the Bush-Cheney cabal. Or doesn’t anyone recall the stampede point for this massive conversion? “Terrorists might poison our drinking water!” OMG!!! The sky is falling!!! Ten years and $150 million later, there’s apparently still no such threat to the drinking water of Bitter Lake and Lake Forest Park. A floating cover is perfectly fine for those guys. But in less than that time Seattle has dropped $150 million and utility rates have doubled. “If and when SPU decides the Roosevelt and/or Volunteer Reservoirs ares no longer needed…” With the kind of density planned for Roosevelt in the next decade, and Capitol Hill already jammed up but still building more, how could we possibly NOT need these facilities? Still holding onto the past. I suggest you get over it. Securing our infrastructure not only created jobs, but put millions of dollars back into this economy. Judging by your Bush/Cheney comment you really put perspective on how narrow-minded you are. As you know Chlorine is used as a primary treatment method, with UV being the secondary. I can assure you, that being in the Water Treatment Industry, our water is some of the best in the country. Go hug a tree! “Anonymous.” It figures. Go back into your Fox News bunker and come back when you’ve got more than a handful of chlorine. I am as anti-Bush as the next guy, but up-grading the national (and Seattle) water supply was long overdue before 9/11. Having treated drinking water sit in open reserviors is a 19th century solution and one that requires much higher level of chlorine application (that you complain about). Upgrading may well have been due, but it wasn’t the big selling point. Allow me to quote directly from SPU’s web site. It’s not quite as stated above. Notice what’s been omitted from the press release quote above? What’s all that about “increased security?” Oh yeah, that’s right. Aqua-terrorism. Please keep in mind that the Seattle reservoir-covering plan pre-dates the 9/11 attacks and the renewed focus on security. The plan was developed out of public health concerns about non-terrorist threats to water quality and the waste of water and human resources to empty and clean the reservoir to ensure that the water in it was safe to drink. 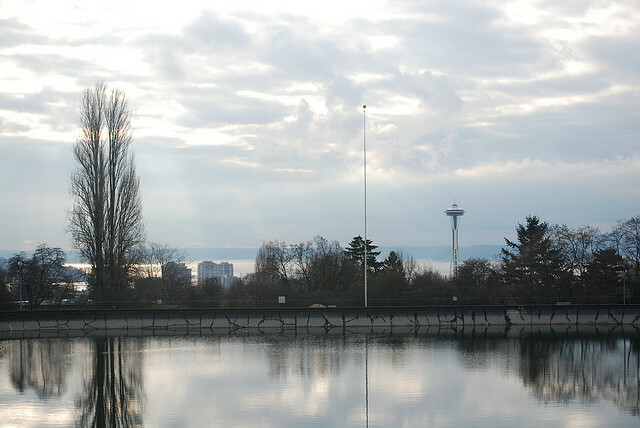 Just curious about the decision to keep the Volunteer Park Reservoir filled as a water feature while Roosevelt residents suffer through two years of living with the eyesore of the drained Roosevelt Reservoir. Couldn’t the latter be kept filled as well? I believe the plan was to try one filled and the other drained. The Volunteer Reservoir is in a large, well-used park. The Roosevelt Reservoir is next to a busy arterial. That is my guess as to why Roosevelt was chosen to be drained. I’ll contact SPU with your question, though. Maybe there is another answer. I have heard from Park Dept sources that, unlike the other Seattle reservoirs, the Ravenna one will not be turned into a park. With thousands of new residents coming to live in the new monolithic Ravenna developments, the reservoir is already slated to go to, you guessed it, more development. How ugly can we make one neighborhood in 10 years? New housing, including low income housing, can always be added by building up, and it should already have been accommodated and paid for by existing new development. Oops! guess we left that part out. Unlike housing, public parks must be totally land based. According to the Department of Planning and Development we will be suffering a 70 acre/year open space shortfall every year for the next 20 years. Without sufficient trees and open space there will be more polluted storm water runoff, more particulate pollution making for more air quality alerts, more heat and heat exacerbated illnesses, fewer birds and urban wildlife, and less community connectivity. We will have less bikable and less walkable neighborhoods and we will certainly not look scenic to visitors. The low income people in particular need open space since they don’t get to have homes with heat pumps, don’t fly to Hawaii for a vacation from big City life, send their kids to camp, or drive to work in their air-conditioned SUVs. This is not the City that was promised to us in the Comprehensive Plan. Density that does not include infrastructure, including green infrastructure, is folly. It’s a mistake that the governors of Seattle are making, big-time, and the neighborhoods pay the price of that folly. got a llot of posiive feedbacks.